History – as self-taught as I am, something as new as the concept of creating netted beading in a jewelry project was a challenge. I took a class on how to bead a bottle at a local bead store after seeing a pattern in Jewelry Designer Magazine and was hooked. The next challenge was finding a source for tiny bottles. Back in those days, persistence paid off because there weren’t too many companies on the Internet and soon I acquired a source or two. The funny part was, years later, these tiny bottles started showing up at local rubber stamp conventions and I had a new source without the shipping charge! Like our parasols, I map out the colors, making sure they tell the story of the bottle as well as sport beautiful combinations. There is even more thought going into a beaded bottle’s purpose…whether it is art imitating life, like in a Watermelon, the concept of the fight against breast cancer or the vibrant, iridescent glow of autumn leaves. Sit with one of our bottles, quiet your thoughts and open your hart and mind each bottle will tell you its story. If you have a concept you want to express in these tiny tributes to life and its wonders, or if you want to celebrate a life that was dear to you and is now gone, I invite you to contact us with your idea and let us create some magic for you in your expression of the beauty and wonder that is life. My first ever beaded bottle. Armed with a large selection of essential oils and a fascination with their properties, this bottle became a tribute to the rosemary plant and a way to carry its essential oil extract. The white beads represent the herb’s association with protection and the red are its fire qualities. The green dagger-shaped beads mimic the slender, evergreen leaves of this tough plant. The stopper is a functional eyedropper. Bottle number three. I fell in love with some buttons I had picked up at the Pasadena Bead & Design Show and the center iris flower on this bottle was one of them. 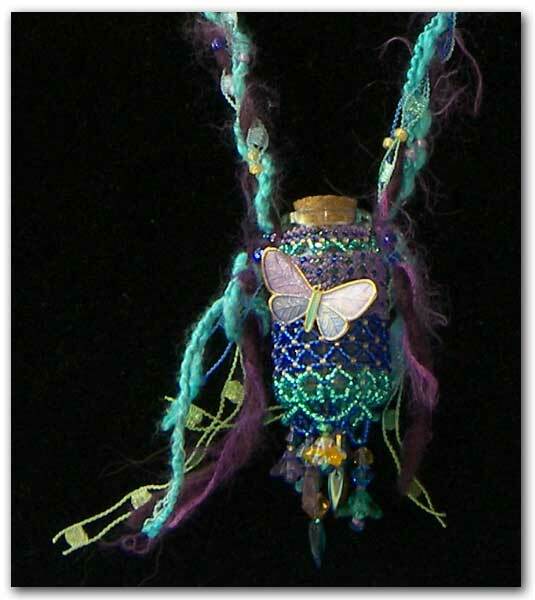 I wanted the colors of the netted beads to be similar to those on the button, which were glittering but muted. The top part of the net reflects the colors of the flower and bud, the center blue the peeled-back, inner petals and of course, the green of the stem. I hand-wove the ribbon for the strap, but chose a green palate so it wouldn’t detract from the bottle, which is the star of the show. The next full-project bottle I tackled. I loved this one as the body and wings of the butterfly button are so colorful and inspired the perfect palette. My style of tightly knitted netting on the body of the bottle started to relax as I had mastered the technique, so for this bottle I opened it up even more than on the Romantic Iris. Then came my obsessive period with yarn at the same time as wanting to show off color and have some fun in a spectrum I had yet to explore. The silk ribbon for the Rosemary Herb bottle was okay, but I decided to see what else was out there in the San Fernando Valley as far as awesome yarns. Jo-Anns gave me a small taste. From there I found a specialty store or two – until I hit the motherlode at a tiny, hole-in-the-wall store in Studio City with narrow aisles and floor-to-ceiling walls of yarn that went on for miles. I can’t tell you how much I spent in there the first visit because my husband, as sweet as he is, would have a heart attack if he knew! While working with seniors volunteering my time in Reseda, I created some pieces for charity auctions. This breast cancer tribute bottle was centered around the colors in a beautiful cancer ribbon I found in a local bead shop, but the bottle was made for an auction that was sadly cancelled. This bottle is looking for a home. The beautiful themed yarn inspired it colors. I particularly delighted in how perfect the weave turned out on the bottle's body and the little, black "seed" beads added a great, final touch. I still wear this one during summer - a lot. It almost doesn't need to be said that this bottle is done up to look like a watermelon, seeds and all. The summertime melon is a tribute to my favorite summer food. The green on the top and bottom of the represent the outer skin, the pale peach the first, inner flesh. Then on to the juicy red and finally the fun little black beads are the seeds!